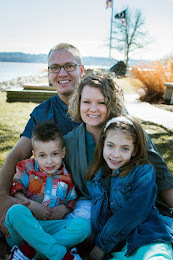 So here is the quick and easy steps to turning your old and drab folding chairs into new, fresh, and welcoming chairs. After you gather all your supplies (I found mine at Wal-Mart and total cost per chair was only $4) grab the steel wool and put a little elbow grease into and get it as clean as you can. My chairs had some dried paint and lots of rust. Once you have finished with the steel wool next grab your can of primer spray paint. Be sure to read all the labels on your spray paint and before you do any spray painting make sure you are in a well ventilated area. So after I finished priming each chair I let them dry over night. 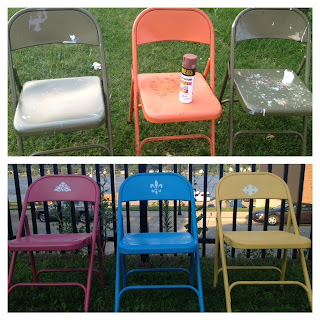 The next day I grabbed my spray paint and started applying thin coats to the chairs. 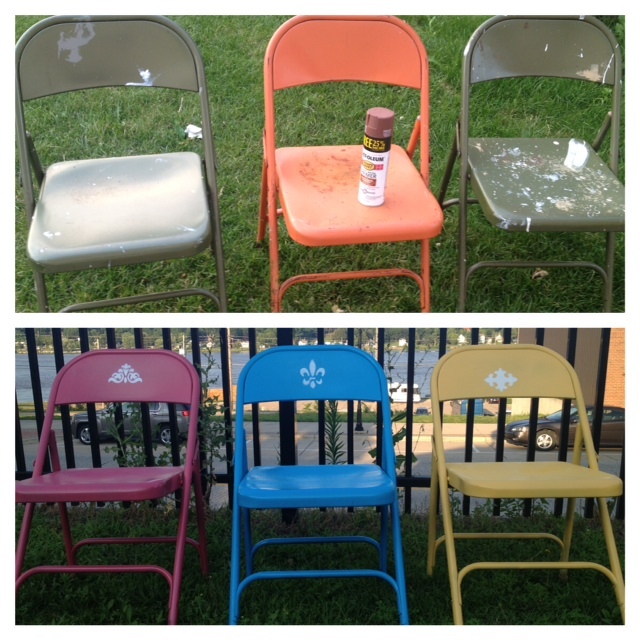 Each chair had several coats applied. Then the chairs were left again for a day. 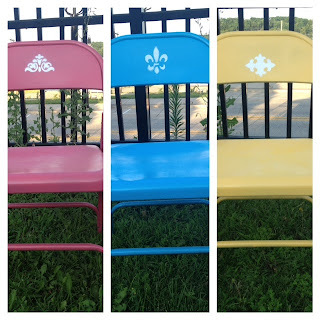 The last day I picked out what stencil I wanted for each chair. My husband also helped by cutting a piece of construction paper so it wold cover the chair more and protect it from back splash. With my husbands help we tried three different methods for applying the stencil. The first method with the pink chair we just applied the stencil to the chair and sprayed it. When we took the stencil off we still had a little spot of back splash. With a hot wet towel I was able to remove most of it. 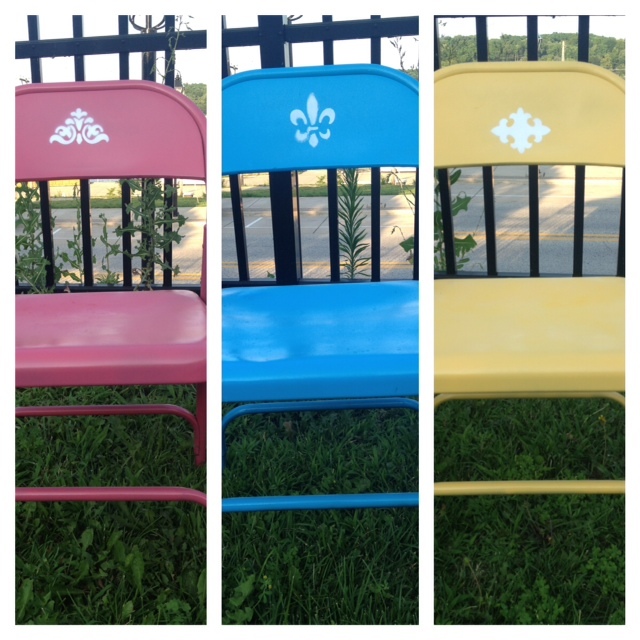 The second chair we applied the stencil and instead of spraying the paint on we sponged it on. It did not work as well as we wanted since it bled through the stencil a little bit making the clear and clean lines form a stencil non existent. The third time we re-tried the first method buy I held the stencil on tighter and my husband did short little bursts with the spray paint can. It worked much better as the stencil appears much more clean!